SHARON, Mass. 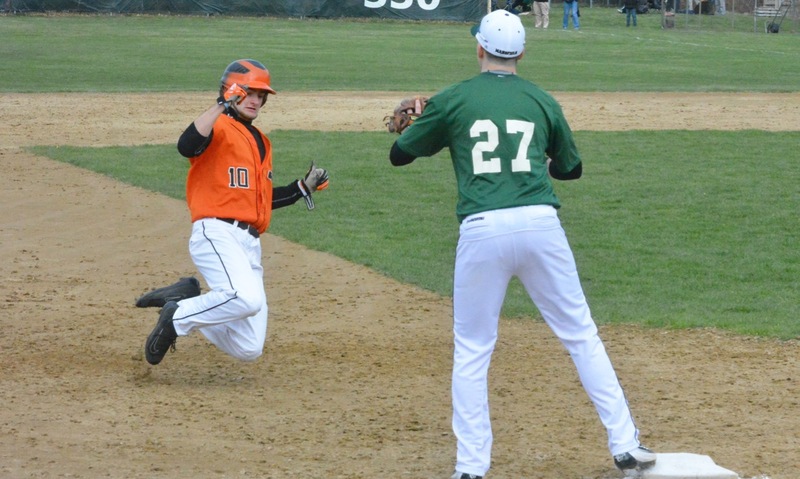 – In a battle between two sophomore pitchers, Mansfield’s Tyler Dalton emerged victorious, throwing a one-hit complete game shutout to give the Hornets a 3-0 over Sharon on Friday afternoon. Dalton and Sharon’s Max Tarlin, who was making his varsity debut, both went the distance. Dalton’s one hit came in the fifth inning, a single down the right field line by Jordan Chabot. 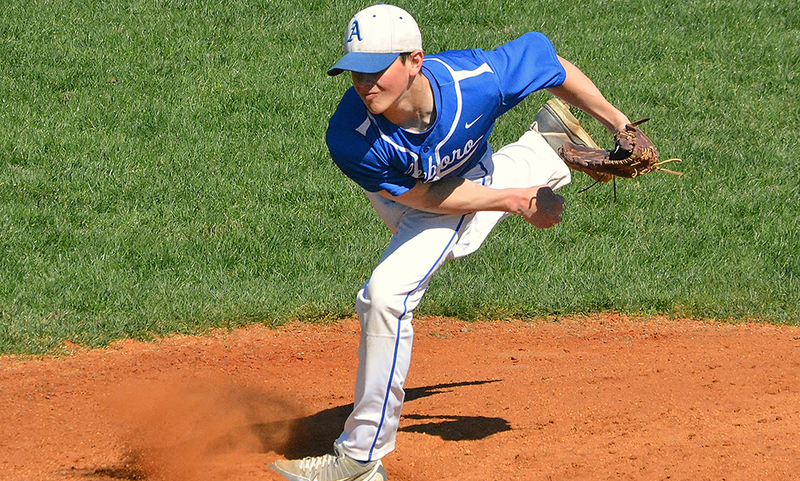 Only one other Sharon runner reached – Jake Teven – on an error in the sixth inning while Dalton finished with eight strikeouts. Tarlin scattered seven hits, issuing just one walk and two earned runs in his debut. Both Dalton and Tarlin had three strikeouts apiece through two innings of play. Mansfield was able to cash in first in the top of the third inning behind a one out triple from Zack Peterson. Peterson ripped a shot to right center field and was singled in by Aidan Cahill on the first pitch he saw. Tarlin recovered with a pop up and a strike out to end the inning. The Hornets were back at it in the fourth inning. Two straight throwing errors that drew the first baseman off the bag put Dan Saraceno and Jake Tryder on base with no outs. Sharon’s Mark Botaish made a nice running grab in foul territory for the first out and a fielder’s choice put runners on the corners with two outs. Max Boen, hitting in the nine spot, drove a base hit up the middle to plate Saraceno to make it 2-0. Mansfield scored a run for the third straight inning in the top of the fifth. Aidan Cahill’s hit eluded the sliding attempt of Sharon centerfielder Andrew Filipkowski, turning a single into a runner on second with no outs situation. Mike Arnold’s single moved Cahill to third and Tyrone Pascual’s sacrifice fly – which was turned into a double play at first – brought Cahill in as final run of the game in from third. Sharon finally was able to reach base in the bottom of the fifth inning when Chabot ripped a two out shot into right field. The Eagles tried to build the momentum by sending Chabot to try and steal second but Mansfield catcher Mike Arnold’s throw and Boen’s tag was in time to end the inning. “It’s a combination of Tyler on the mound, kind of growing up a little bit in the last couple of weeks, being able to get over a hit like that because he knew what he had lost, I could see it in his eyes. And then getting some help from a senior captain, throwing the guy out at second to kill any of their momentum, it was a big one,” Breen said. Although Tarlin was dealt the loss, he was impressive in his first ever varsity start. He struck out seven in seven innings of work. Mansfield baseball (3-6, 4-7) will look to make it two in a row when they travel to the Kelley-Rex leading Warriors of King Philip on Monday. Sharon (1-8, 1-10) will try to bounce back when they host Milford the same day. MANSFIELD, Mass. 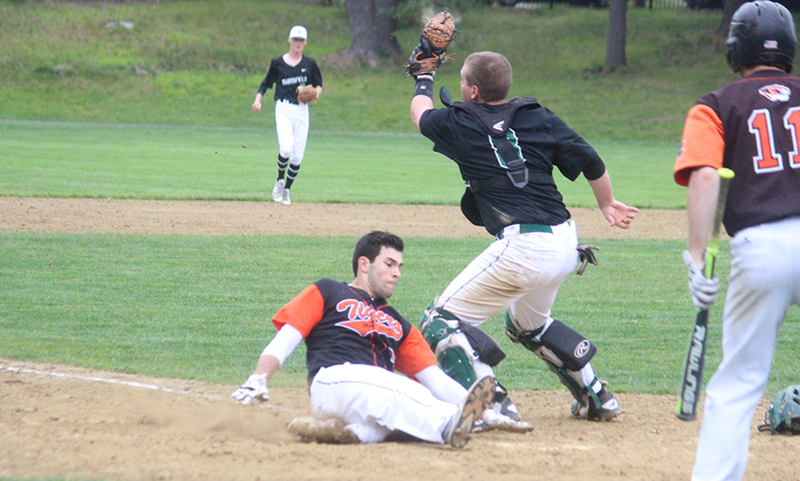 – Mansfield bounced back from an early deficit with three runs in the bottom of the fourth, cutting the Stoughton lead to just one. In the top of the fifth, Hornets starter Jack Neureuter gave up a lead-off single but then retired the next two hitters and induced a grounder to third that looked likely to end the inning. The Hornets were that close to being back at the plate down by just one, but the throw to first was wild and the inning stayed alive. The Black Knights took advantage and then some. Stoughton sent 15 batters to the plate in the fifth (including 12 after the second out) and scored 10 runs with two outs to break the game wide open and cruise to a 14-3 victory at defending Kelley-Rex champion Mansfield in the season opener for both teams. The Black Knights took the lead in the top of the second. Jack Connelly led off and was hit by a pitch. Joe Piana followed with a single to left and Connelly made it to third on a Chris McNulty fielder’s choice. Pat Hagerty plated the opening run with a groundout to first. 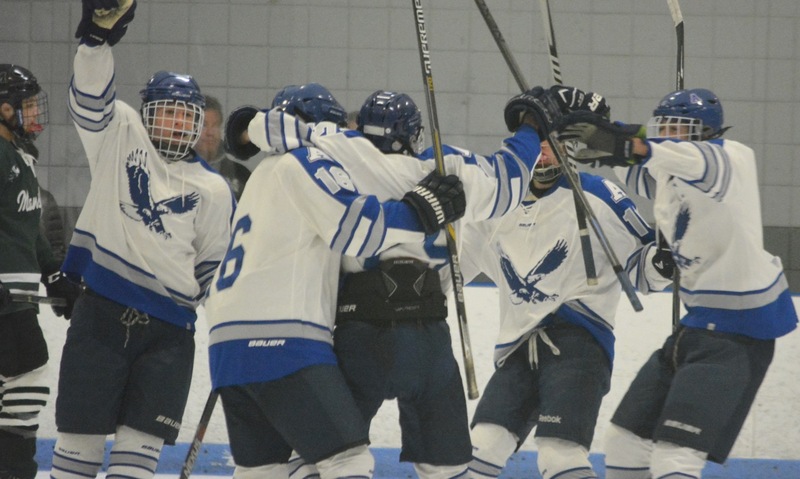 In the third, Stoughton put together a two-out rally to extend the lead. Jake Gibb (4-5, RBI) started it with a single to left, followed by a single from Doug Seaman (2-4). Connelly chased a 2-0 pitch at his eyes but then Neureuter came over the plate and the junior first baseman drove it to right center for a two-RBI triple. Piana made it 4-0 with an infield single. It was only a precursor for what was to come in the fifth. 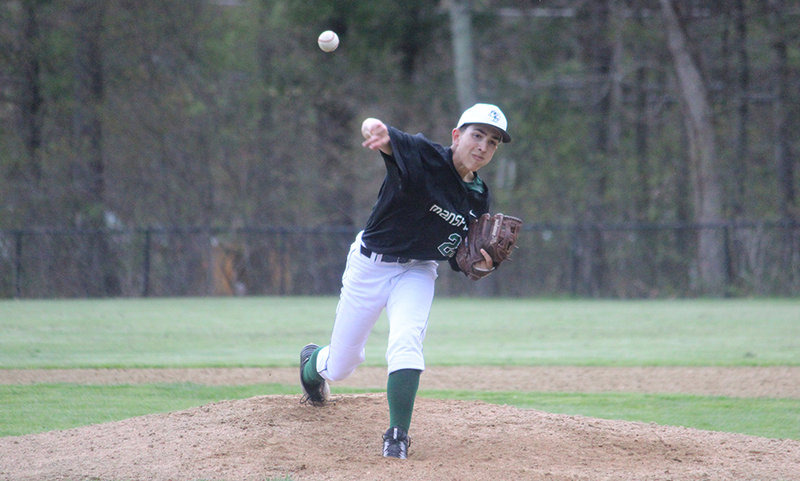 Mansfield had a chance to cut the lead in the third, but Stoughton starter Ryan Sullivan, who struck out five in five innings of work, got Mike Arnold swinging with two runners in scoring position. In the bottom of the fourth, the Hornets did bounce back and get on the scoreboard. Tyrone Pascual walked to begin the inning followed by a Kevin Dow single and both runners moved up on a Sullivan wild pitch. After a strikeout Jake Tryder knocked in both runs with a single. With two outs, Matt Farragher, who reached on a fielder’s choice, was brought home by a bloop double down the rightfield line by Charlie DeMassi. The Hornets nearly carried that momentum into the fifth, but the error with two outs and a man on first turned into a game-changer. Nick Quattrucci singled in a run and the leadoff hitter Justin Hutchinson brought in two with a single to right. Sullivan, the ninth hitter of the inning, helped his own cause and brought in two with a double to right center that chased reliever Tyler Dalton (who came in the inning before). Gibb followed with an RBI single off new pitcher Jon Needle. Seaman singled, Connelly walked and Piana got an RBI when he walked with the bases loaded. Facing the third Hornets pitcher of the inning, David Simmons, McNulty then added his second hit of the inning with a double down the line in left that scored a pair of runs and made it 14-3. After having to battle through his previous two innings, Sullivan came out firing for the bottom of the fifth and pitched a perfect frame, including a couple of comebackers that he fielded cleanly. Breen was disappointed in the final result, but acknowledged that it was only game one of a long season and admitted that the weather at the start of the spring had an impact on the team’s preparation. Mansfield (0-1) will look to bounce back on Wednesday when it hosts division rival King Philip. Stoughton (1-0) will travel to Frothingham Park on Wednesday to face rival Oliver Ames.